How To Deep Clean Large Flat Surfaces? 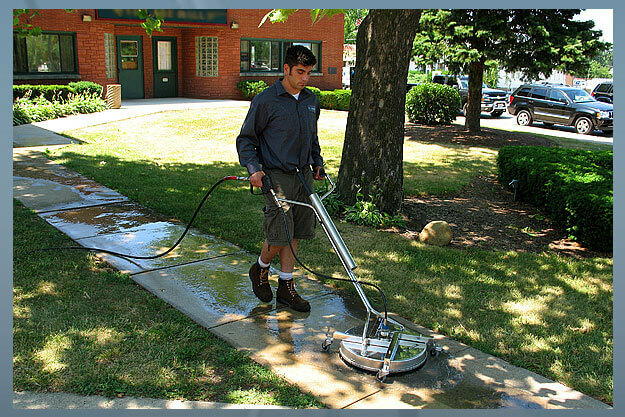 Pressure washer surface cleaners are powerful and reliable. They are used for high pressure cleaning driveways, concrete floors, parking lots, roofs, warehouses, boat ramps, garage floors, boat decks, and more. The benefits of using these products are clear: effective, shorter working times, enormous energy savings and long useful life due to their high industrial quality. You will be able to complete your power washing tasks in the shortest possible amount of time. To determine the size of the orifice needed for your surface cleaner or see the table to choose the right nozzle for your machine. 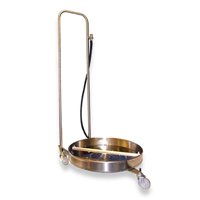 Disinfection for the highest hygiene demands in saunas, bathroom areas, and in the catering industry. Great for cleaning driveways. 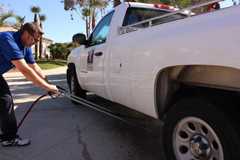 Read more about driveway cleaning. Get all the answers on HOW SURFACE CLEANERS WORK? The following comparison chart shows the time taken to clean a typical driveway (400 sq. ft.) using 2 different components. 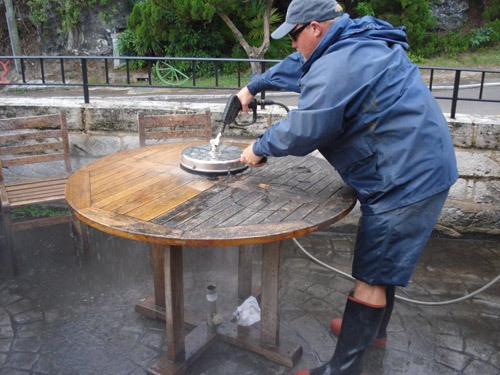 Rotary Surface Cleaners save TIME and your BACK! ...virtually any flat surface can be cleaned up to 15 times faster with the Ultimate Washer cleaning system! Multi function, multi task Surface Cleaner Line is used to clean brick walls, RV's, boats, stadium, stairs... No overspray or flying debris guarantees a safe, clean work area. 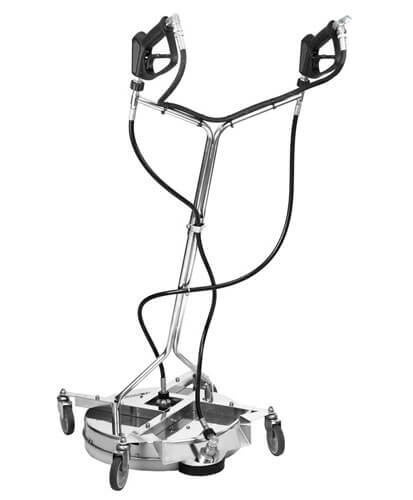 MO-FL-EG200 Features include: stainless steel deck construction, swivel toggle joint and quick connect lance with a relax action gun. 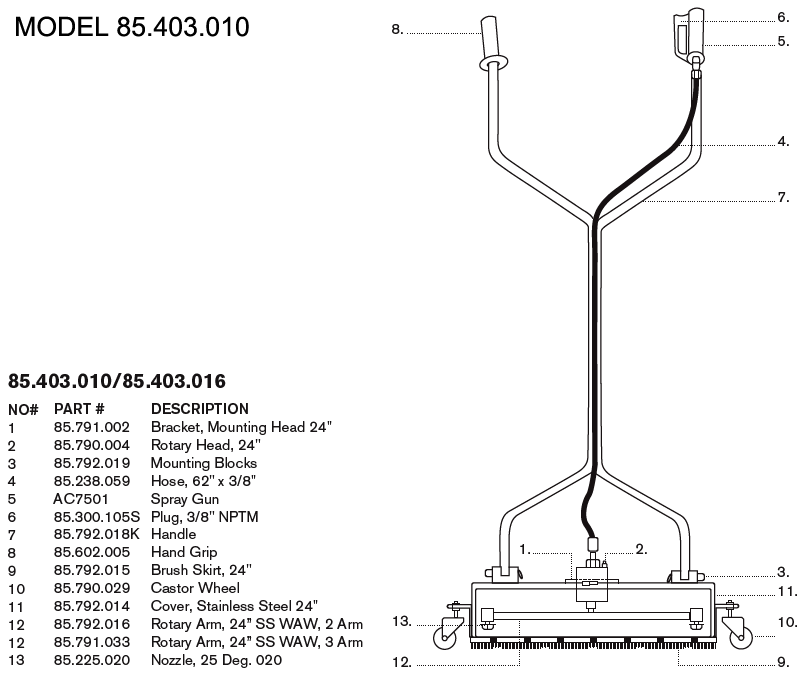 No tools required for assembly. 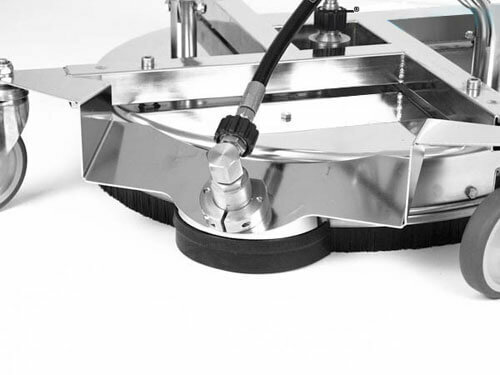 If you want to do the job faster, you can go with a wider stainless steel surface cleaner, from 12 to 30 inch wide. Finest New Product: Introducing the Industries first Toggle Swivel. 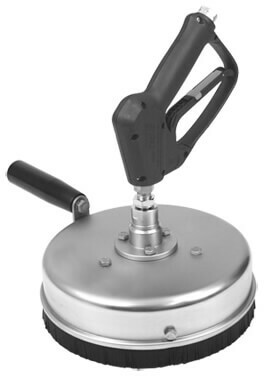 Contractor Duty High RPM Swivel with integrated toggle joint allows for use as Floor and Wall Cleaner. The Toggle Joint feature comes with an adjustable tension system to allow effortless cleaning on walls and angled surfaces. Multi-use surface cleaner is small and light enough to use of vertical or horizontal surfaces using it with an extension wand or telescoping pole. 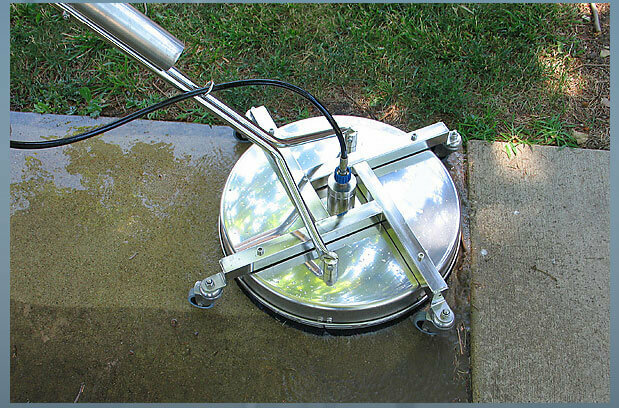 Made of light ABS plastic, this surface cleaner offers the ability to clean in tight spaces. Used to clean flat surfaces quickly, easily and evenly. 16" diameter with nylon brush skirt. These high pressure surface cleaners are the most economical unit on the market today. It is inexpensive and will complete any job that has been placed in front of it. 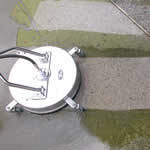 These concrete cleaners are used to clean flat surfaces quickly, easily and evenly. 20" diameter with nylon brush skirt for faster cleaning times. 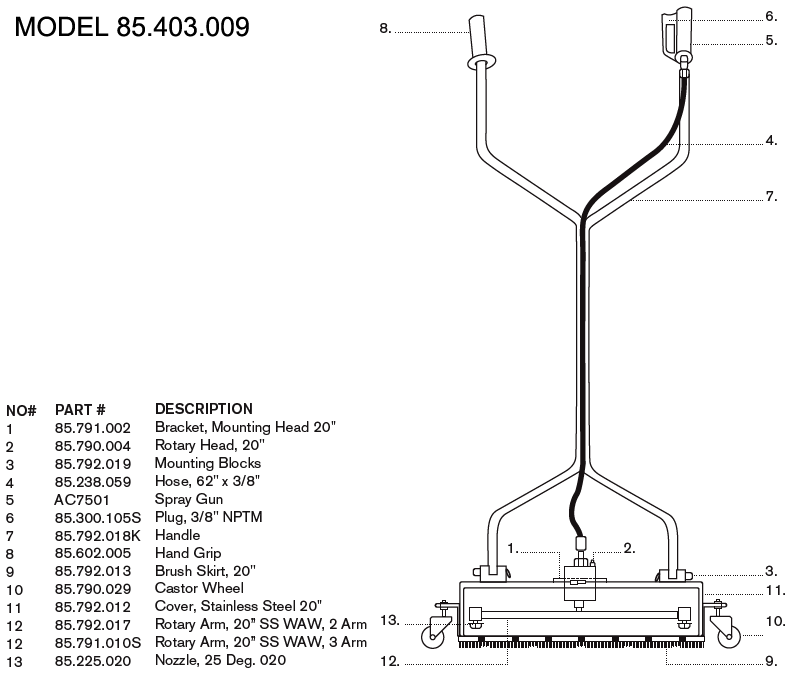 This dynamic unit is an excellent washing tool for medium to large cleaning areas. Color: Yellow Housing. Aluminum handle. Accommodate almost any surface or application. Use on driveways & walkways, decks, stairs, roofs, under trailers or vehicles and more! The ANTUNH Surface Cleaner is a 3 in 1 tool with removable casters as well as the capability to be flipped over for undercarriage cleaning. It features a high quality carbide swivel that spins up to 2000 RPM allowing the user to clean up to 15 times faster than an operator with a handheld gun. Roll it - Caster wheels allow for effortless motion in any direction on flat surfaces. 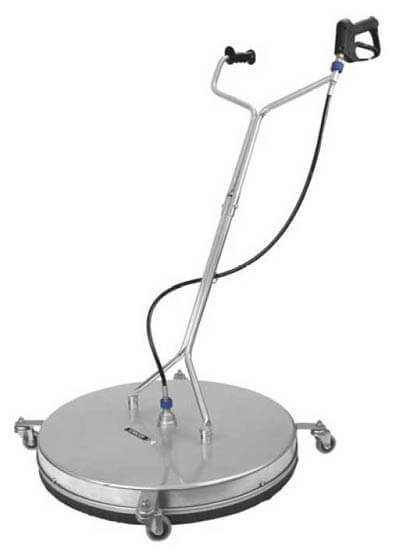 Float it - Casters are hand removable to convert the surface cleaner into a floater; making it easy for cleaning uneven surfaces, such as, decks, stairs, roofing, and more. 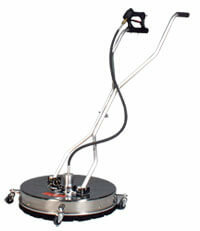 Flip it - Casters are removed, easily flip unit over, replace casters for easy under carriage cleaning. Duo-arm high pressure washer surface cleaner cleans 30 percent more efficient in 30 percent less time. 20" diameter. 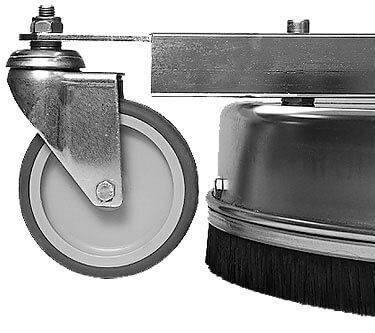 Comes with casters and a 20" diameter nylon brush skirt. Also available in 24". See other benefits using our flat surface cleaner. At first look at the box when it arrived, I was almost ready to return it. The box was battered and torn UPS has gotten worse in handling packages. But the good new the washer was not damaged. In putting it together the pins that hold the handle to the base were short or the bushing in the retainers was not pressed in far enough. After doing some engineering I (we) got the ring clips to work but I almost destroyed the Ring Clips getting them in. Not sure I can get them out without cutting the rings off the pins. Trying to adjust the wheels was another challenge. Need some try special wrench or something the nylon insert nut was hard to move because there wasn't an easy way to hold the bolt. But once I (we) got it together it worked fine. The clevis pin was too short. Luckily there was a hardware store nearby and we ended up using a bolt and nut to connect the head to the shaft. After fixing it, I was pleased with its performance. At this point I have only experimented with limited use. However, even with such a small test I am impressed with the way it works with my 3000 psi washer. Using it to clean paving stones it avoids all the blowback you get when using a wand and I now don't need to put on my full body wet suite. Further use will prove its durability. Very satisfied with the quality for the price at this point. This attachment to our pressure washer is a real help--it shortens the time required to do large surfaces, and really does a good job cleaning accumulated dirt, mildew and gunk from our concrete carport, back patio and sidewalks. Very easy to attach, and simple to use. Cleans up gum and other sticky debris. The perfect cleaner for any type of contractor work. 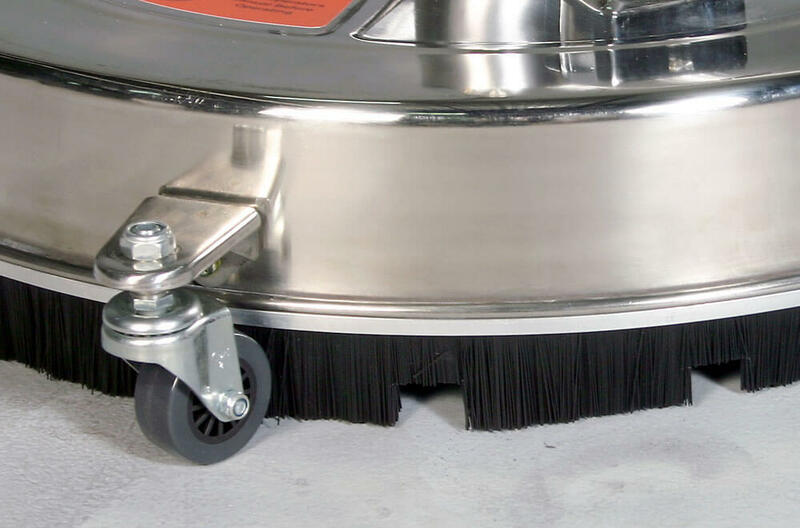 The stainless steel casters guarantee an effortless cleaning experience even for extended use. 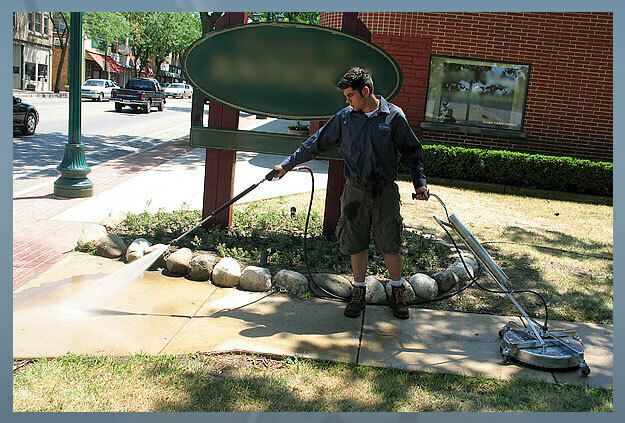 Clean sidewalks, parking lots, tennis courts, shop floors, patios or any other large surface. 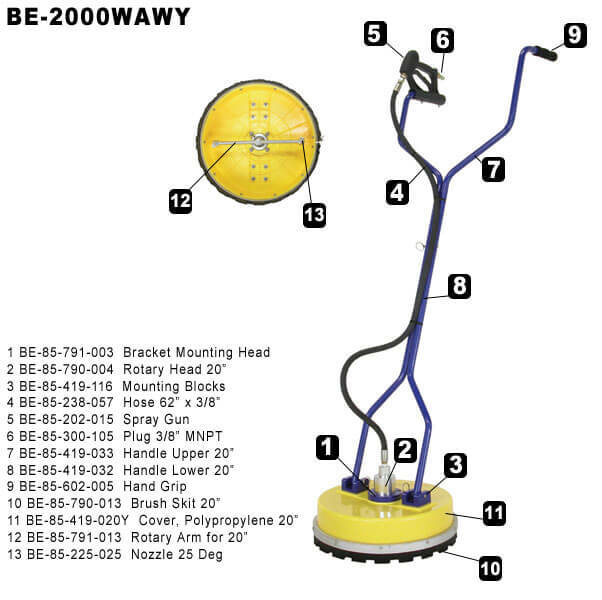 These high pressure surface cleaners feature a specially engineered high rpm swivel which guarantees long lasting operation under tough conditions. No cleaning task is too much for this professional surface cleaner! 1" Adjustable Height: Stainless steel guard for extra strength and stability. Adjustable impact range guarantees an efficient cleaning on any type of surface and allows for a side to side sweeping action. 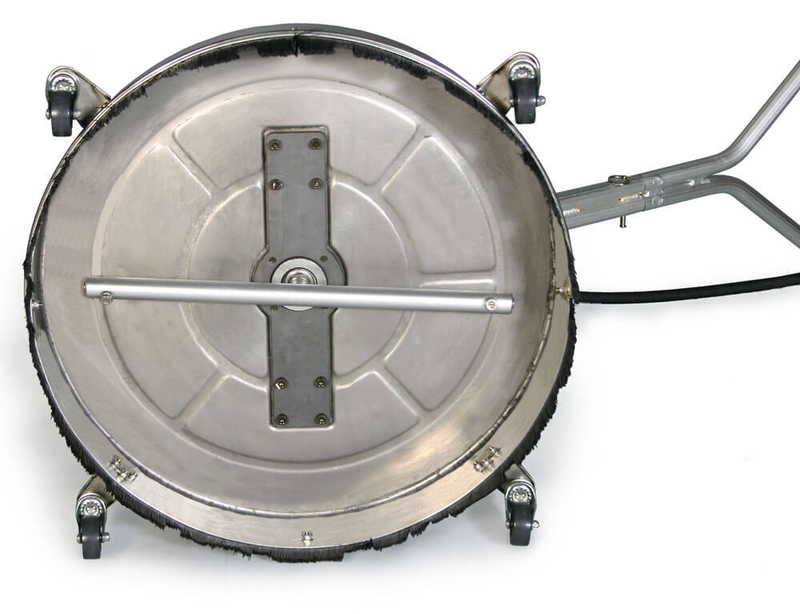 Premium Quality: Four 2 1/4" stainless steel casters with custom mounting ensure easy manoeuvring even in tight spaces. 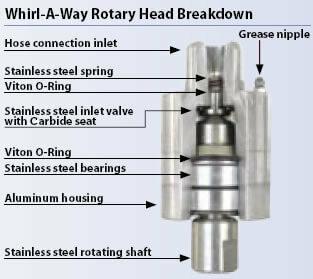 Swiss Engineering: High RPM stainless steel Swivel features reinforced self lubricated stainless steel ball bearings for improved performance. The dual spring based carbide seal system guarantees long-lasting operation under tuff conditions. Two Tools In One: The 30 " Spray wand quick connects to the existing HP Gun. Always handy, this wand is ideal for cleaning out corners and other hard to reach areas, allowing you to go where your surface cleaner cannot. This is a unique surface cleaner with a built-in wash water recovery system that completes two tasks in one easy step. 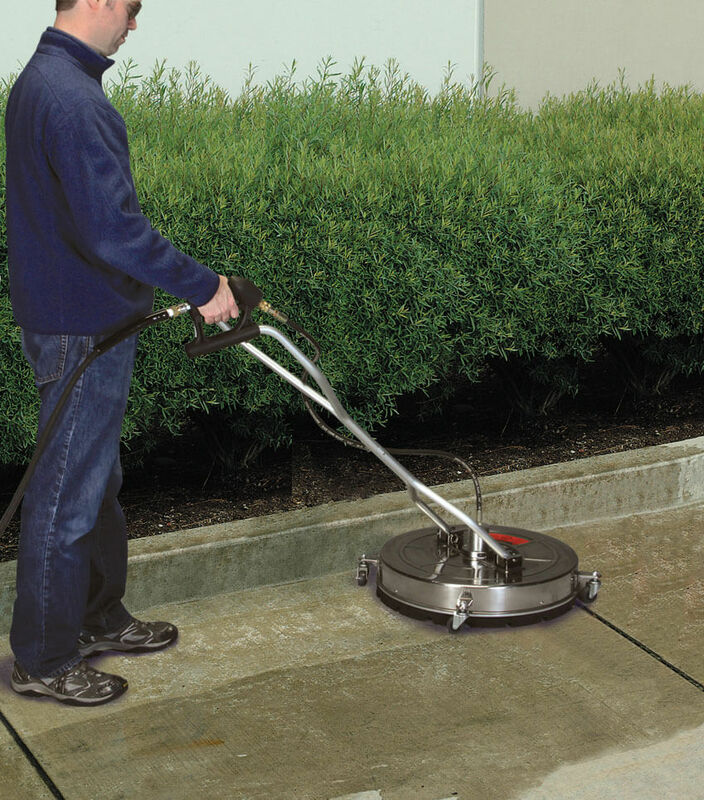 When connected to a pressure washer the HYDRO VAC cleans the surface, vacuums up the waste water and pumps out the waste water up to 100' away. Recover water and debris "on the fly" from hundreds of feet away. Recover 98% of the water. Capable of water recovery out to 600' from machines. Use indoors or out with no overspray and no containment problems. Expand your opportunities for higher-paying environmentally sensitive jobs and more profit. This is a ball valve kit that can be used up to a 7250 PSI pressure.